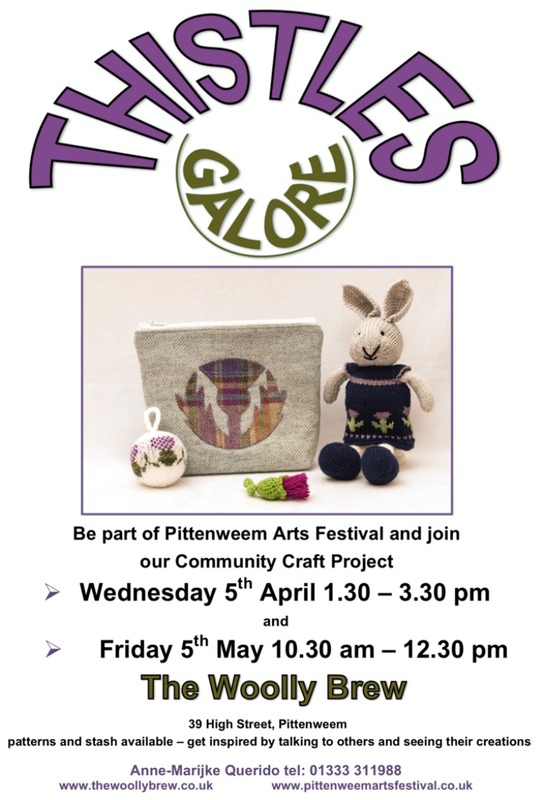 We have another set of dates for the Pittenweem Arts Festival Community Craft Project - Thistles Galore. Project Co-ordinator Anne-Marijke will be at the shop on the 5th April (and 5th May) with her box of stash and book of ideas. Please come along and get some inspiration... and join this successful community project. We've got a folder stuffed with thistle ideas and a Pinterest board too. As usual you can knit, crochet or sew. All items will be sold during the Pittenweem Arts Festival in August. Christmas in Summer, Its a Hoot, Winter Warmers, Couthie Cushions, Festive Flowers and Bonnets to Berets. These links will start at the end of each project, you'll need to scroll through them to see the full story! Over the past 8 years this project has donated £16,292 to different charities!